Zongozotla is a municipal capital in the Sierra Norte of Puebla, Mexico. December 8 is the festival of Purisima Virgin de Concepcion which is celebrated with dancer, food and mass. Mayordomias pay for dancers, mass, the wax offerings and the food. 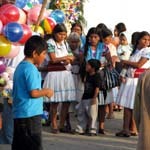 The festival to the Immaculate Conception has all the elements of a traditional festival. It is financed by Majordomos; there are dances, food for every one, processions, mass and more procession, offerings of wax figures. During the festival, members of the sponsoring family participate along with friends and other relatives. They help with decorating alters, planning the food, serving the food, the music, the dancers and wax offering. They feed anyone who shows up at their door, all are welcome and all are received with open arms. When I first arrived the dancers were just finishing their dance at the Alter and the tamales of Moles de Cumin and Tamales of beans were just being served. Before I knew what was happening, I was eating some delicious tamale. The dancers includes, Quetzales, Negritos, San Miguelitos, Espanoles and Torriedores. The Virgin of Guadalupe is carried with dances and music around the town and then into the church. All the time accompanied by towns folks, dancers, music and sky rockets. All the dancers celebrate the arrival of the Virgin at the church.